Normally, I put some sarcastic comment about the current page here, but I’ve got none for this one. Baldur does what he does best, whether Seren likes it or not. In this case, probably not hard to guess how she feels. Good news! Issue #4 is now available on Comixology! You can get it by clicking here! This means that ALL of our finished issues are now available both on Comixology for reading via tablets, smartphones, or their web app if you like AND on our Gumroad store, entirely DRM-free if that’s what you’d prefer! 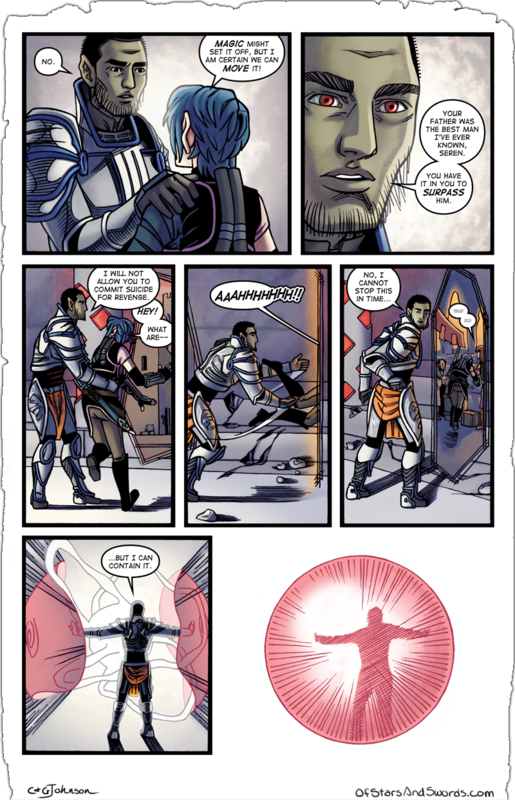 Also, the very nice people at Girls Like Comics reviewed Of Stars and Swords! They said some very nice things and you should go check out their site. Not just for our review, but for others. They do very good work and are worth your time! That’s all for this week! Some more announcements of various kinds are potentially coming in the next few weeks and we’ll keep you updated here, on our Twitter pages, and on Facebook! And when it comes to the comic itself, time to hang on because it’s about to be all downhill from here to the end of the issue. This is what we’ve been building towards from page one!